I just want to give way to this advisory from OMF Lit about their ongoing nationwide book sale. This will be for a good cause, that is to help the victims of super typhoon Yolanda, thus everyone is invited to participate and be a part of this campaign. Philippine Christian Bookstores all over the country will be having a joint Inspire-All-You-Can sale! 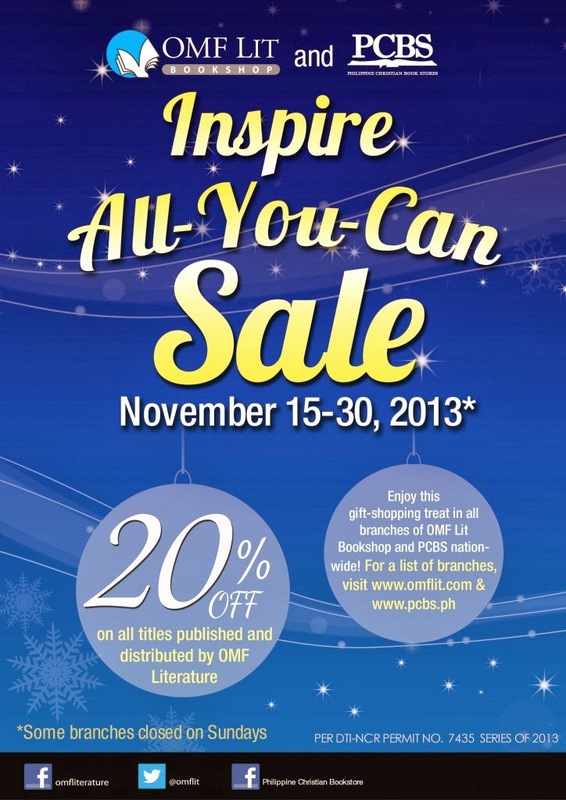 From November 15-30, enjoy a 20% discount on OMF Lit published and distributed books at all OMF Lit Bookshops and PCBS branches nationwide! But more importantly, all purchases you make at our OMF Lit Bookshops will help our brothers and sisters affected by Typhoon Yolanda. A portion of our sales from November 15 up to December 31 will go to relief efforts. You can also drop off your cash donations at any of our bookshops and we will make sure that they will reach those who are most in need of your help. Inspire our loved ones, colleagues, classmates and even strangers through words that can challenge, encourage and change their lives.